This winter is really dragging for me… 60 inches of snow in one season is a bit much. In order to enjoy some part of the winter, I have still been cooking some hearty meals before springtime supposedly hits. This week, I made sheperd’s pie… but obviously couldn’t eat the traditional dough crust on top, so I added my own gluten free twist! 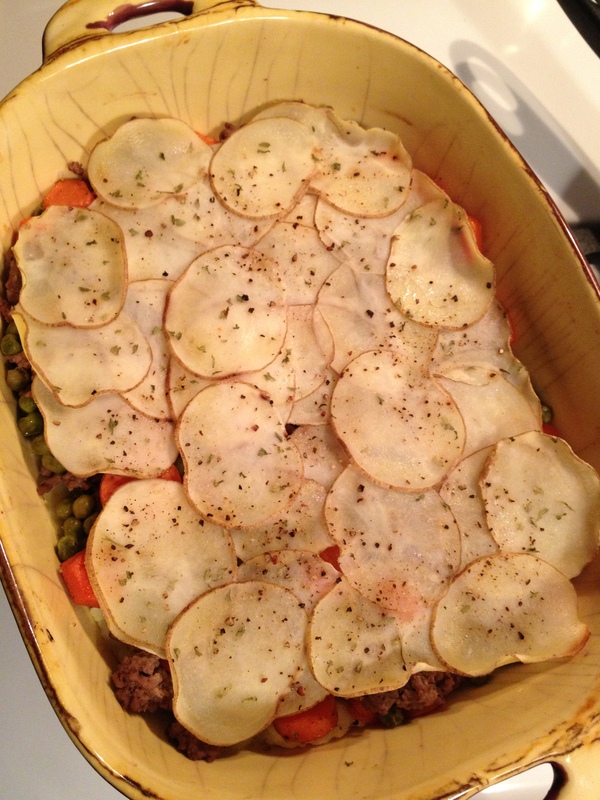 The base is mashed potatoes, the middle is meat and veggies, and the top is crispy potatoes. Peel and chop the 5-6 russet potatoes into one inch cubes. Boil several inches of water in a large pan. Add the potatoes and boil until fork tender. Drain. Put the potatoes back into the large pan. Add the butter, coconut milk, 1 tsp. lemon pepper, 1 tsp. garlic salt. Mash until desired consistency. In a large sauté pan with a half inch of water, simmer the carrot rounds just until tender. Drain any extra water. 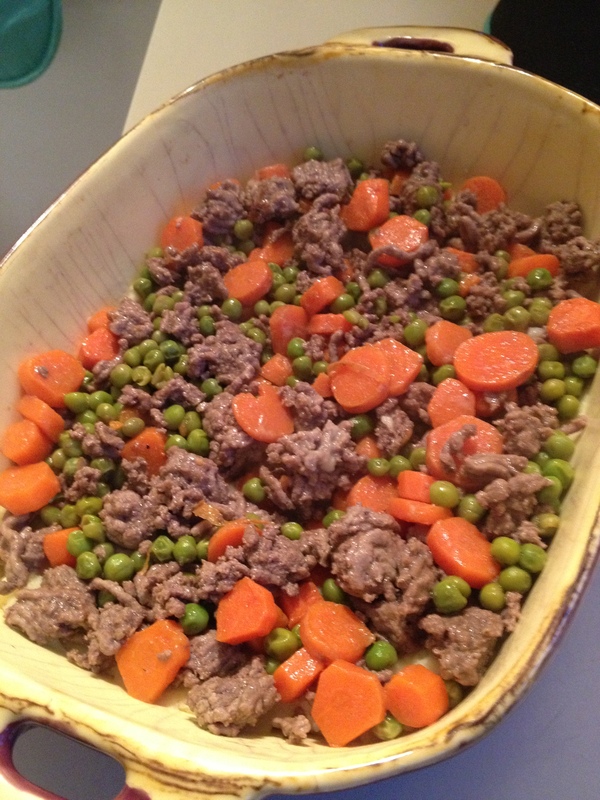 Add the ground beef, peas, red wine vinegar, 1 tsp. lemon pepper, 1 tsp. garlic salt. Saute until the beef is cooked through. Drain any extra liquid. 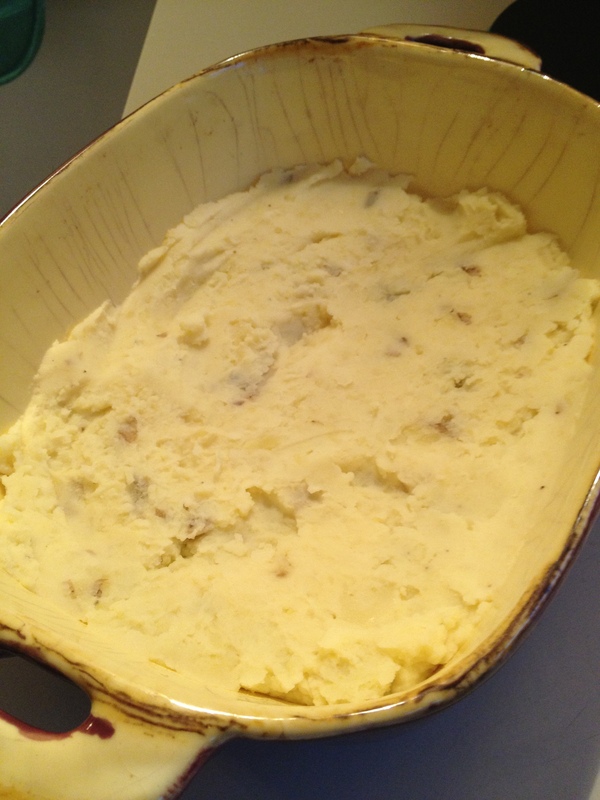 In a large baking dish, spread the mashed potatoes. Layer the beef mixture on top. On top of the beef mixture, use a mandolin to shave potato slices from the extra russet potato. Cover the beef mixture evenly with potato slices. Using an olive oil mister, spray the potato slices lightly with oil so they will crisp. Sprinkle 1 tsp. lemon pepper, 1 tsp. garlic salt, and dried parsley on top. Bake at 350 degrees about 20 minutes, until potatoes crisp on top. Layer 3 and final king’s potato pie! I am really loving having a grill and the summer to enjoy it in! It is such an easy cooking method and perfect for summer foods. Lately, I have been enjoying grilled corn on the cob and chicken. 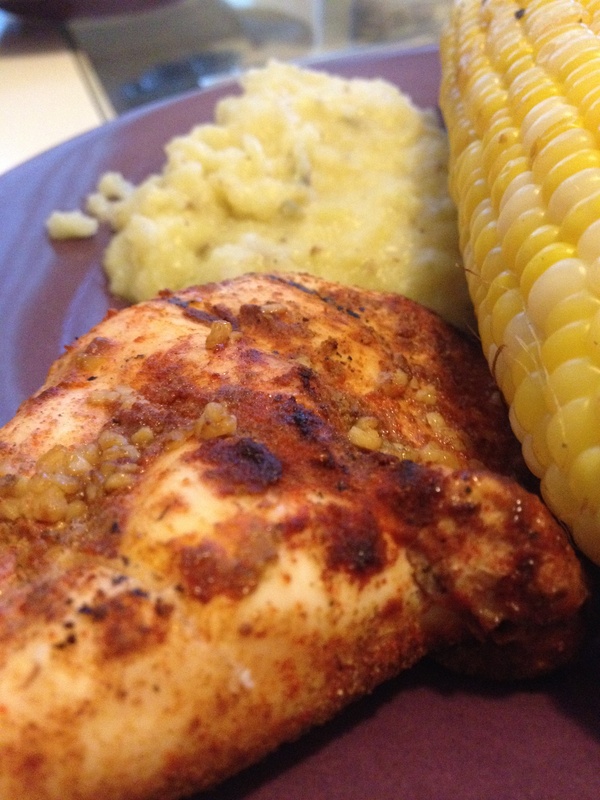 Here is a smokey chicken rub that I tried and loved. The chicken marinade makes it especially juicy and tender when served hot off the grill. Yum! In a large bowl, coat both sides of the chicken with the garlic salt, paprika, cinnamon, cumin, nutmeg, red chili powder, and ginger. Add the lime juice and garlic. Let the chicken marinate for about 3 hours. Grill until chicken is cooked through and serve hot! My mom makes these perfectly crisped potatoes that are a great side to any meal, so I had to try them myself! 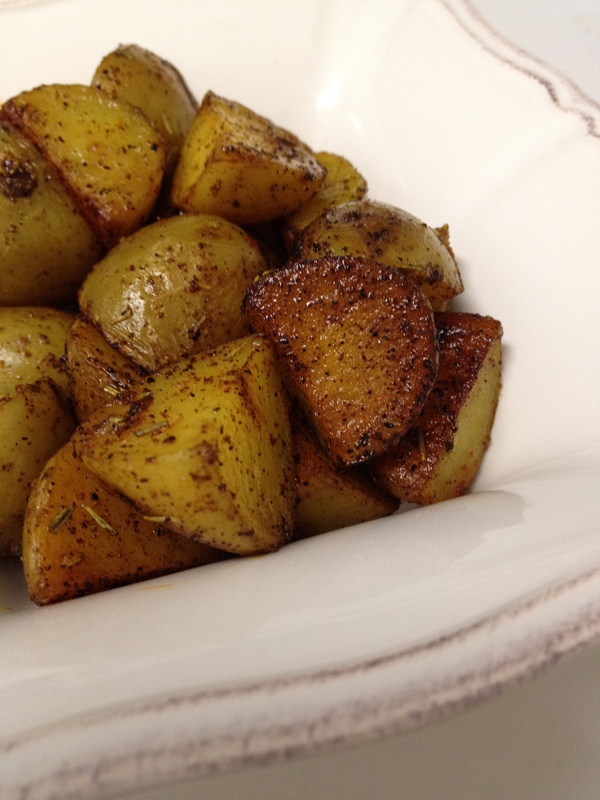 Potatoes are a great base that you can add so many different flavors to. Here, I used garlic salt, lemon pepper, and paprika. Great flavor combination! Steam them… either in a steamer or with a steamer insert and covered over boiling water. Steam about 8 minutes, until fork tender. Coat a large saute pan with the olive oil over medium high heat. Let the oil heat for 1-2 minutes. When the potatoes are very dry, put them in the large saute pan with the olive oil. Add the garlic salt, lemon pepper, paprika, and rosemary. Stir every couple minutes until they get to desired crispness, about 8-10 minutes. Spring has sprung… time for pesto! Happy spring to all those enjoying these wonderfully warm days! In my mind, winter is officially over… but I will only bring out the flip flops one day at a time until we all really believe it. In the summertime, I enjoy making pesto with fresh basil. 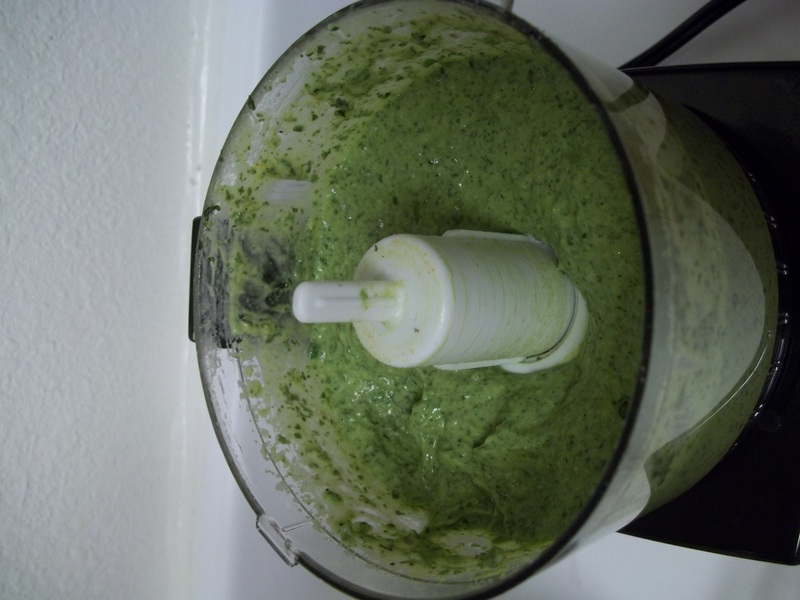 Basil is available this time of year, but it is not as good as it is in the summer… so I made Spring Pesto. Spring Pesto uses a basil base, but other in season ingredients to boost its flavor. It is very rich and easy to make. Chop on high until well blended. Normally, pesto is served on pasta. 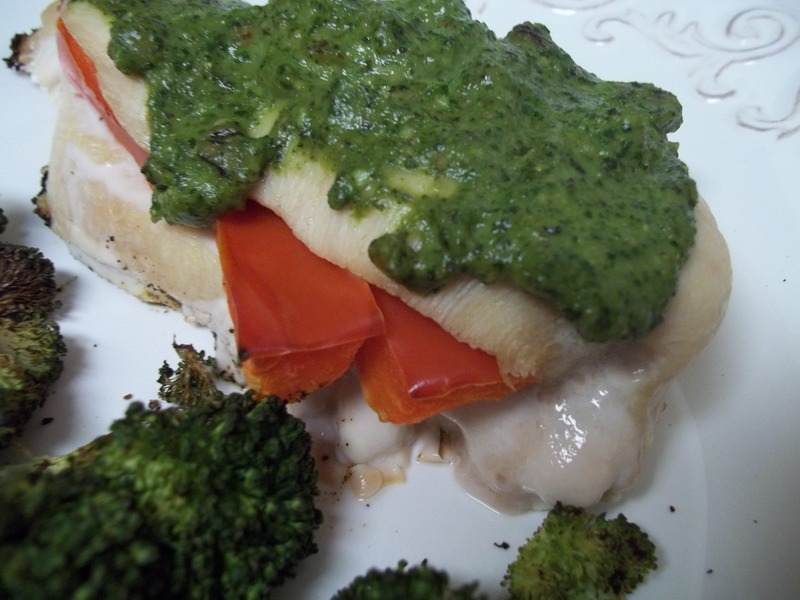 Instead, I stuffed chicken breasts with red peppers and smothered them with the pesto. Then I baked them at 375 degrees for about 35 minutes, until done. Delicious!